Living so close to the coast has many perks: weekend beach trips, year-long tans and more seagulls than you can throw a box of chips at (seagulls tend to lose their appeal after the age of two, but we’ll call it a perk anyway). Yet all of these seaside delights pale in comparison to a good old-fashioned boat party; and luckily for us, an epic one is about to drop anchor. The YOT Club is gearing up for its maiden voyage this weekend, and we’ve spent the week preparing our sea legs for the occasion. This stunning entertainment venue is 130 feet of floating fun. 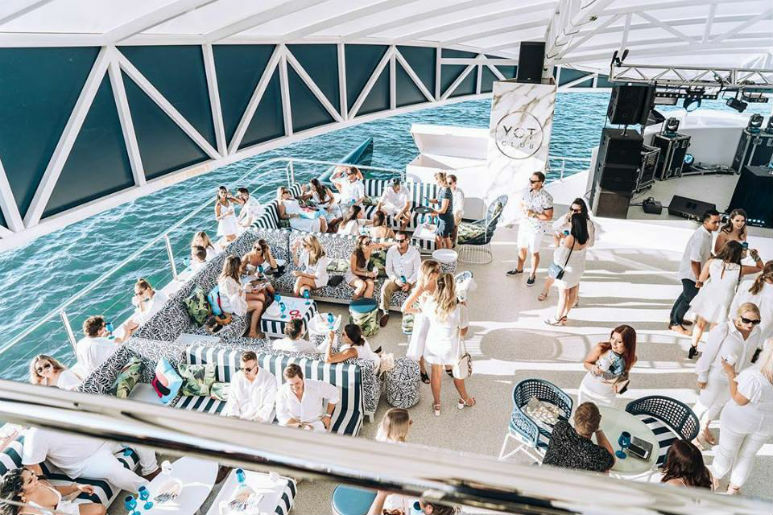 Equipped to host up to 400 guests, the YOT Club will host regular events across the Brisbane and Gold Coast waterways and is also available to rent out for private functions (I’d be sending a link of this to whoever is in charge of the company Christmas party). The vessel boasts two impressively stocked bars, complete with tap beers and highly skilled bartenders to mix up a variety of classic and bespoke cocktails. The ship is lined with luxurious lounges with private seating available for reservations on the top deck. If you REALLY want to impress you can book The Green Room, a private VIP area with its own cocktail bar, 20-person lounge seating and exclusive entrance (talk about extra). But wait, there’s more! An eight-meter-wide stage will host local and international acts to serenade us as we gaze out to sea and resist the urge to recreate the ‘king of the world’ scene from Titanic. Not to mention a state-of-the-art kitchen which, depending on the occasion, will serve restaurant quality seated meals or a selection of gourmet canapes. Head to the website to check out their upcoming events and secure your spot, tickets a sailing out the door!